April | 2013 | Quo Vadis? As you may know, computer software and hardware vendors offer discounts on some of their products for currently registered students and faculty of academic institutions. Current Rutgers Law students and faculty have access to discounted products from Apple, Dell, and HP! To take advantage of this perk, go to http://findtech.rutgers.edu. Ignore the menu on the right and click on the graphic that says Technology and for Personal Purchases. The clickable graphic now should display Apple Store, Dell Store, and MRA International Store (with the HP logo). Choose the online store that you wish to visit. You will be prompted to sign in (use your RU NetID and password), and then you will be taken to the online store that you selected. You will be able to view their products at the discounted rate. You can get these same discounts even when you start out at the Apple Store homepage. On the Apple Store homepage, scroll all the way to the bottom, where you will see more “store” options: Under More Stores, select Education. The next page will prompt you to input your school. Whether you use “Rutgers Camden” or “08102,” you will get 3 options for this campus. Unless you are enrolled in (or working at) the School of Fine Arts, any one of the remaining two options should work for viewing and purchasing at the discounted prices. If you prefer a Dell product, you can also start out at the Shop Dell homepage. In the menu across the top, select Student & Member Purchase. Dell calls this site “Dell University.” From here, the products that you look at will display the student-discounted price. When you are ready to check out, the Shipping Information fields will prompt you, not only for the name of your institution, but for your student or staff ID number, as well. However, if you prefer a HP product, the easiest way would be to go through the FindTech site mentioned above. Unfortunately, you will only be able to view the discounted products after registering and signing in. If you are registering for the first time and you went through the FindTech website, the account information (Rutgers – Personal) is already filled in within the relevant field. How do you know what you’re saving on these products? The Vendors’ education stores do not provide comparisons between their regularly-offered prices and the educational-discount prices. If you’re curious about how much you are saving, then you can do a real-time comparison using different browser windows. If you have any questions, here are some FAQs from the Rutgers FindTech page. If you have any more questions, feel free to email me or stop by the Reference Desk! A small selection of some skills videos on DVD in the Law Library. Whether you’re looking to improve your performance for your next trial advocacy try-out or competition, or you’re preparing for a career in litigation, a little extra practice and preparation can go a long way. After all, practice makes perfect! The law library has DVDs on Reserve to assist students in preparation for trial success. These instructional videos provide insight, advice, and in some cases, sample forms on a separate disk or within the accompanying workbook. 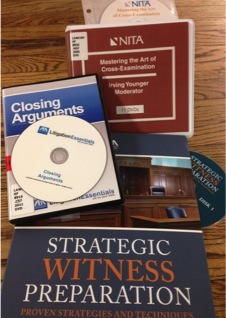 These videos offer examples for and instruction on important aspects of litigation, from preparing a lay witness for a deposition to closing statements. Please visit the Study & Practice page of our website or see a reference librarian for a complete listing of skills videos. Most of us use Google or some other search engine nearly every day to look up anything and everything for our personal and professional needs and curiosities. With all that use, it’s easy to think of yourself as an expert, even if there is even more to learn! To help you become an even better online legal researcher, the law library has put Google for Lawyers: Essential Search Tips and Productivity Tools on reserve! 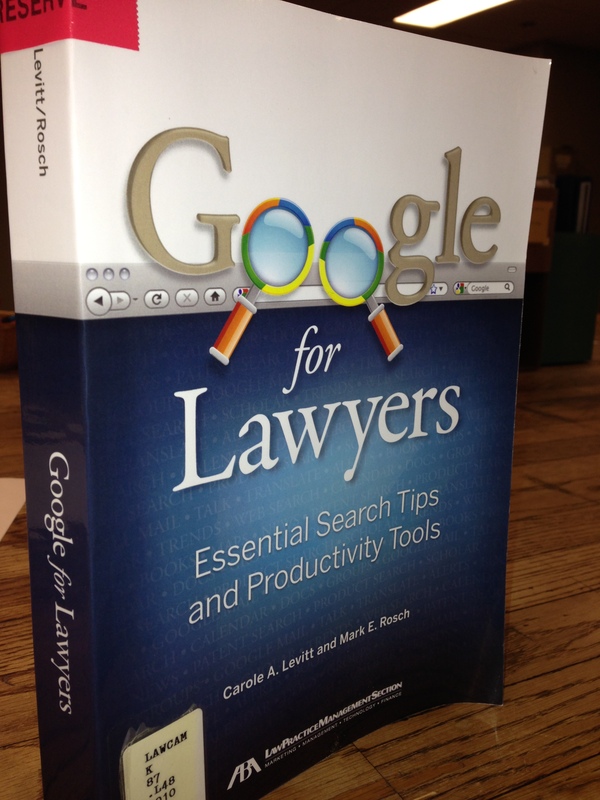 Google for Lawyers is published by the ABA and covers both novice and advanced search and management tips and strategies that can enhance your research and productivity. Even better, you can learn about some of the services offered by Google that can help you manage your work and your practice, like Google’s free office applications, tools and databases. Trial preparation is so much more than finding relevant case law and statutes; it is about finding out facts about the case, the parties, and the witnesses. This book can enlighten you about how to do this kind of fact investigation more effectively and efficiently. Google for Lawyers also includes stories from lawyers illustrating how they have used these tips and strategies in their practice. If you have any questions about these titles, or about search tips and strategies in general, please stop by the Reference desk and a librarian will be happy to assist you. To check the status of this title, click here. Just a note: the law library has recently acquired the updated, 2012 edition of this title 2013 edition of Google Gmail and Calendar in One Hour for Lawyers, another ABA publication that includes commentary from attorneys, which will also be put on reserve. One more thing to note: Google, itself, has responded to this demand for better research skills by offering their own courses. Power Searching With Google has been popular for allowing participants to hone their research skills at their own pace. These search tricks and tips are just that; should you decide to start a Power Searching with Google course, make sure to keep in mind how the tools and processes that you’re learning can be applicable when conducting your legal research, as well.